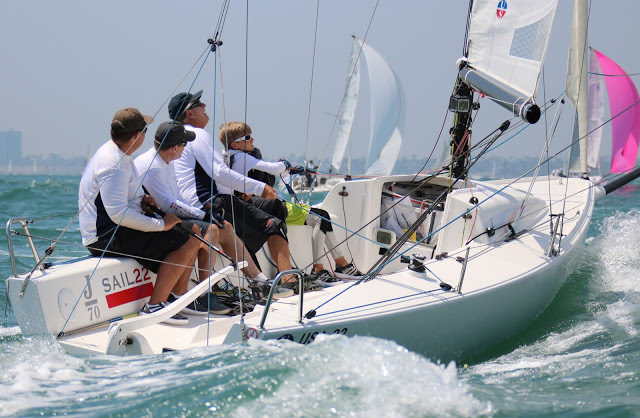 One design racing is a major part of Ullman Sails Long Beach Race Week. The J70 class showed up as the largest class with 27 boats. The talent, skill and fun ran deep with World, Olympic, America’s Cup and National Champions sailing this weekend. No matter what your crew or skipper level, consistency was key to scoring at the front of the fleet. The race committee ran 7 races all with course 6 of S-W-L-W-F, that is consistent. All 5 boats on top of the leaderboard on Sunday afternoon sailed all 7 races with only one double digit finish score, that is consistent. The winner sailed all 7 races with no finish higher than 6th place, that is more than consistent, that is what wins regatta’s. Predicted medium westerly winds never showed up on Friday and Saturday. In its place was a light and shifting southerly that fluctuated 15-20 degrees and up and down from 7-9 knots of wind with the early arrival of cloud cover from the cooler ocean. The upwind legs needed some left off the start line, get right with the puffs and then the left paid time after time on final approach to the windward mark. Downwind was all about staying in the starboard gybe “train” until the fleet made a one and in gybe for the leeward gates. Some boats tried gybing back to the middle of the course for more options when approaching the gate. But, too much bad air from the 26 boats coming downwind in the light air made the move rarely pay off but resulted in loosing a couple of places. Trust me, we tried it on USA-32 in race1 and went from 5th to 12th in half a downwind leg! Oops! The leeward gate was another opportunity to gain and loose positions. The J70’s were the 4th start on the alpha course, so this meant the leeward gate was sometimes won and lost battling with Farr 40’s and J120’s for buoy room and most importantly clear wind. The final upwind was not a piece of cake (btw, Scott Deardorff’s “Cake” USA-351did win 2 races) because the wind would still be shifting 15-20 degrees with puffs from the left. So, settling in for simply going left or right after the gate was not going to keep your spot. USA-32 had a bad gate choice in race 5 entering in 6th but when crossing boats up the course from the opposite gate was now in 12th or 13th. Playing the left-middle-left USA-32 climbed back into 4th by the final windward mark. Definitely no time to breath or relax! There was passing in every puff and slight wind change. On Sunday the wind finally came up to 10-12 for both races to have a great day of sailing and final showdown for the J70 class. Flojito y Cooperando led with Sugoi, Midlife Crisis, USA32, Catapult and Minor Threat in hot pursuit and staying consistent would determine the podium positions after race 7. More wind does not mean easier racing. The better wind but shifty wind made the combo of boat speed and tactics the secret ingredient. Catapult and Minor Threat made a move to the front, but Flojito y Cooperando and Midlife Crisis stayed consistent (there is that word again) with a 1-6 and 5-5 finish to take 1st and 2nd place for the weekend. Catapult and Minor Threat finished strong to take 3rd and 4 the place. USA-32 finished with a 6-8 on Sunday to tie Minor Threat, but moved to 5th for the weekend. Ullman Sails Long Beach did not deliver BIG breeze, but did deliver very good and right racing. The J70’s proved to be the darlings of the regatta with the largest turn out and ultra friendly sailors on and off the race course. J70 sailors now move up the coast to Santa Barbara for the Fiesta Cup and then on to the SF Bay area for the PCC’s, Rolex BBS and the 2016 World Championships.